author. actor. luxury commentator. communicator. Musician Dave Carroll said his guitar was broken while in United Airlines’ custody. He arrived at his destination to discover that his $3,500 Taylor guitar was severely damaged. After harassment from the United Airlines, he wrote the song “United Breaks Guitars”. The YouTube video was posted on July 6, 2009. It amassed 150,000 views within one day, prompting United Airlines to contact Carroll saying it hoped to right the wrong. The video garnered over half a million hits by July 9, 5 million by mid-August 2009, 10 million by February 2011, and 15 million by August 2015. And besides ruining the reputation of United Airlines as most-unfriendly and careless airline and becoming famous, Dave got guitars, with best compliments from the Taylors. On 28 December 2014, AirAsia Indonesia Flight QZ8501 was scheduled for an international passenger flight from Indonesia to Singapore using an Airbus A320-216. The aircraft then stalled and crashed into the Java Sea, killing all 155 passengers and seven crew on board. It’s the then CEO Tony Fernandes thought it was his duty to start directly responding to tweets of aggrieved near and dear one of the passengers. He kept responding directly to all the concerns of the passengers’ family and friends. He never checked syntax or spelling, but he ensured that these messages conveyed his empathy towards their loss. Gone are the days when companies used to get at least a day to frame their crisis strategy, prepare a party line and call for press conference. The rise of social media channels have become so powerful that today a crisis, once generated, needs to be addresses immediately. It is also critical that if the crisis is generating in a particular media, it needs to be addressed in the same media. Otherwise, by the time you will get ready to address the same in the conventional way it would have snowballed into a bigger crisis. Let me share some golden rules for crisis management. A crisis management team needs to formed comprising the top management including CEO and CFO, and the Chief Communications Officer/Corp Comm Head. The idea of the team is to assess the gravity of the crisis and see if it can be prevented and then strategise on the response as well as the media of response. It is also important to understand when the CEO needs to be exposed and how. The toughest call, however, is when the CEO or Chief should apologise, for example, in case of a crisis like an air crash. Most of the crisis can be prevented if we have our ears on the ground and we pick up the right noises. These noises and conversations can be either on social media or to every point of contact with the clients – be it sales or client managers/executives. To identify correctly where there is a lapse in every moment of operating discipline (EMOD). There are, unfortunately, organisations which hide and suppress client’s complaints to keep a squeaky clean glitch report are most vulnerable to a crisis and are the ones who miserable ruin their brands in the process. So the task force will identify the areas or cracks or rather chinks in the armor. A press conference needs to be called at the earliest but communication flow should start immediately and in whichever media it is being generated. No one from the organisation, except the designated spokesperson, should speak – either to media or to shareholders or to the affected party. Even “no comment” is a comment and so is better than silence or incommunicado. Be responsive. It is important to understand the problem the customer is facing. So talking to clients on social media and addressing their issues is the best way to do that. It is best not to even try to remove the grievances from social media platforms, they are bound to snowball and come back in a gigantic and unmanageable form. It is critical to always keep customers at the center and have a process of proper redressal of complaints. Otherwise, companies should not be on any social media platform. For leaders, it is imperative again to be responsive. A leader can’t outsource the handle entirely. That will backfire. A leader needs to be personal at times, giving the followers a feeling that they are in touch with the real leader. Tricky questions by journalists need to be handled carefully. It is a widely-used tool by journalists to get voices from otherwise media-shy leaders by provoking them. Remember cattle-class? 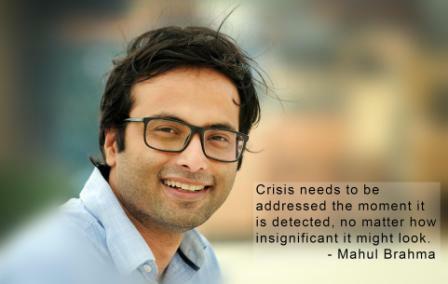 Crisis needs to be addressed the moment it is detected, no matter how insignificant it might look, chances are that it will snowball into a disaster later if not addressed. Remember, a crisis can arise from any quarter, from any medium.